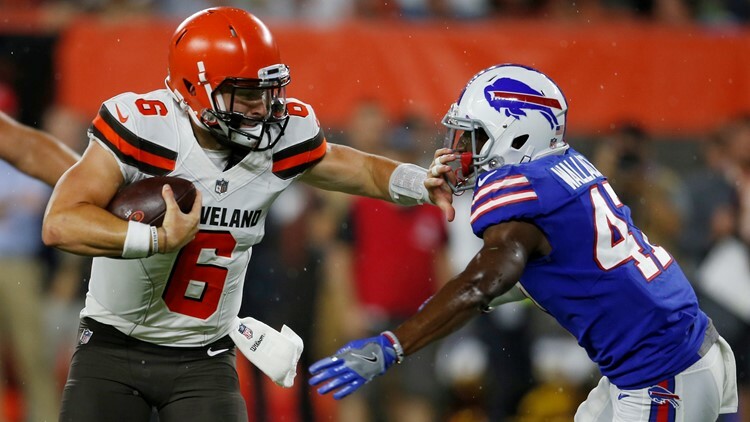 Cleveland Browns quarterback Baker Mayfield (6) stiff-arms Buffalo Bills defensive back Levi Wallace (47) during the second half of a preseason game at FirstEnergy Stadium in Cleveland on Friday, August 17, 2018. Reportedly, the Cleveland Browns are slated to host the Buffalo Bills on Sunday, November 10. CLEVELAND — The Cleveland Browns’ 2019 regular-season schedule is five hours away from being released, but information on dates and times for games has filtered out through social media throughout the day. According to Ryan Talbot of New York Upstate, the Browns will host the Buffalo Bills at FirstEnergy Stadium in Cleveland on Sunday, November 10 at 1 p.m. All-time, the Browns are 12-9 against the Bills, but they have lost four of the last five meetings. Earlier Wednesday, it was reported by Manish Mehta of the New York Daily News that the Browns would travel to the New York Jets for a Monday Night Football game at MetLife Stadium in East Rutherford, New Jersey in Week 2. Also, The Athletic in Boston reported the Browns will travel to New England for a Week 8 game against the reigning Super Bowl Champion Patriots at Gillette Stadium.